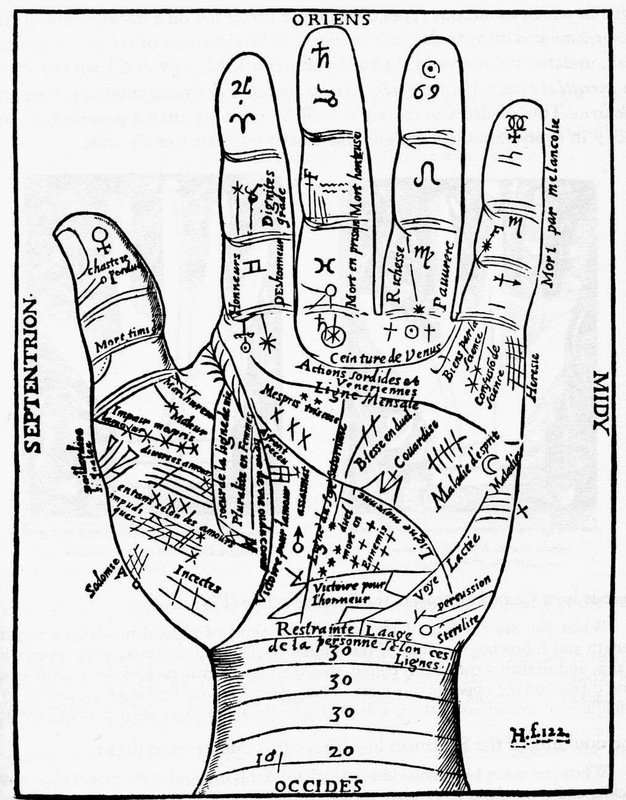 The art of palm reading is solidly linked to astrology. Humans are considered a microcosm of the whole of creation, and as such, the hand a microcosm of the microcosm. All its parts are governed by the planets and the zodiac. 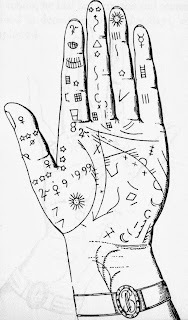 Hermeticists state confidently that nothing was left to chance in Creation, including the lines on the hand, which must, since serving no psychological purpose, be in constant relation with an individual’s faculties, and like the stars, they indicate both character and fate allotted to us. 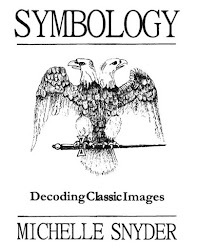 Job 37:7 is singularly favorable to cheiromancy as translated by Maistre de Sacy, “God, who sets, as it were, a seal in the hand of all men that they may discover their works,” or “God has placed signs in the hands of all the sons of men, that all the sons of men may know his handiwork.” Taking strength from such an authority, the cheiromancers established a complicated science with abundant illustrations. 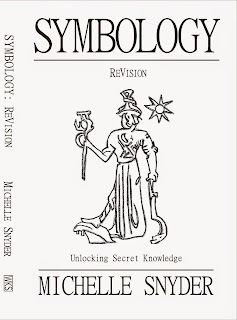 As it is a psychological science announcing both physical and moral character, and a divinatory art as if predicting ones future, it was connected to medicine through the first, and with the second became an integral part of occultism. It is commonly considered that the left-handed lines are best for reading, as most people are in the habit of being right handed; consequently the left hand does less work which results in the lines being well preserved and complete. Some might say the destiny of man is written upon his left hand, others that his right hand shows what he has done with his life. Robert Fludd, in Utriusque Cosmi Historia, has a diagram which expands on the ideas of d’Indagine. 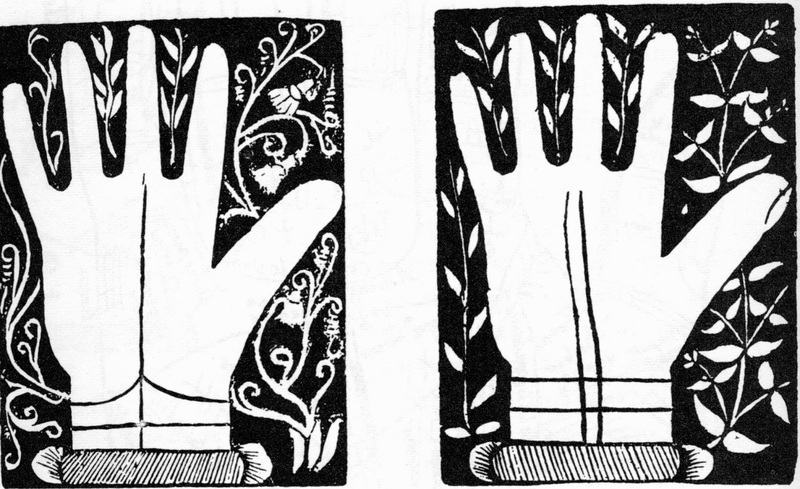 The lines dividing the wrist from the hand are called restraint, rosette, bracelets, and various other names. When well marked they indicate a long happy life. 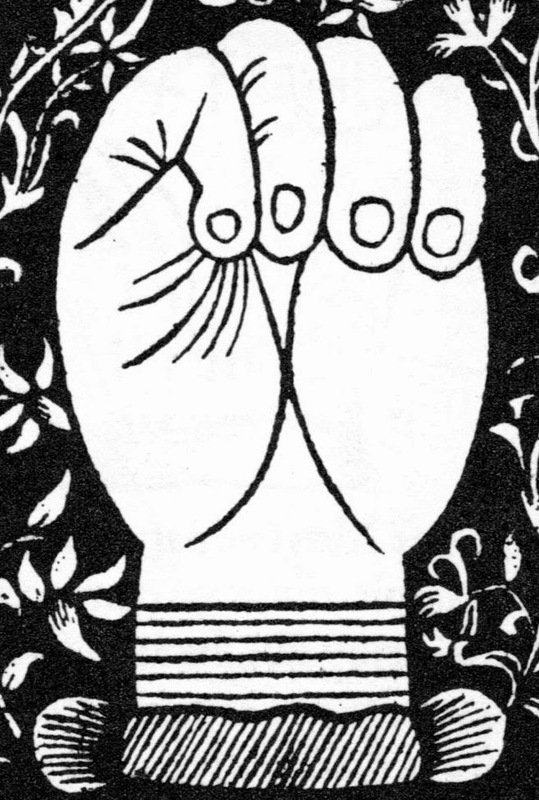 The edge of the hand, or percussion – as used for striking with a clenched fist – contains lines of imagination and generation. 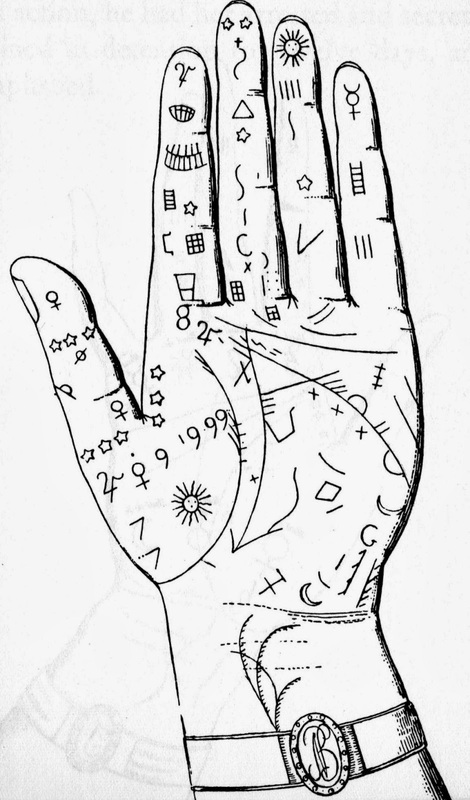 The hand is subject to planetary influences. 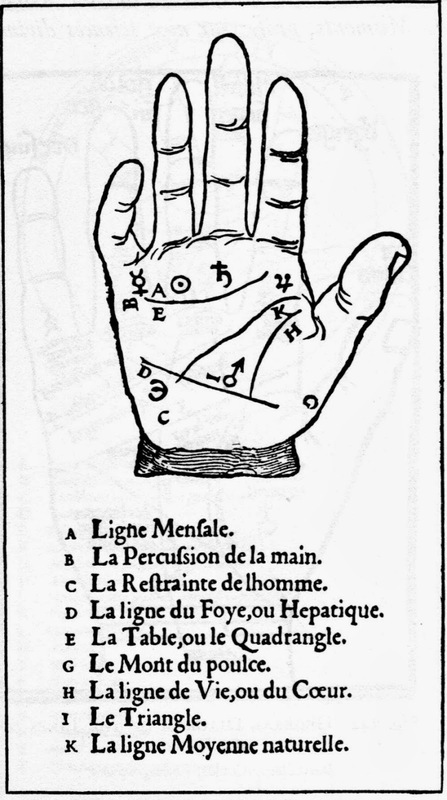 This illustration from d’Indagine shows the forefinger belongs to Jupiter, middle to Saturn, third to the sun, little one to Mercury, and the thumb is ruled by Venus. Mars has the palm, and the percussion belongs to the moon. There is some variety of assignment by different practitioners. Cardan, for example, gives the little finger to Venus. Jean Belot illustrated a more complex division. The particular ways which the lines cross each other, their general bearing, direction, and intensity all combine to produce an inexhaustible variety of interpretations as varied as those in astrology. The accuracy of these interpretations depends upon the skill, experience, and clairvoyant power of the cheiromancer. He may find too late that he failed to perceive a whole array of things he could not see at first. 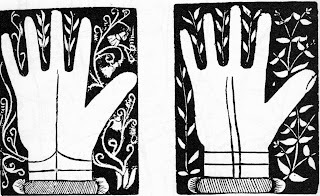 It is said in this art that the hand of each person should show the approximate date of his death, indicated by a break in the Line of Life. The length of life is sometimes calculated by the number of bracelets. The lines on the percussion show how many children the subject will have. We will look at only a few horoscopic interpretations of the best authors, as there are too many combinations to consider them all. Line of prosperity, thick and long, meeting the bracelets, and of good color – this is a subject that will be a prosperous in all his dealings. The opposite indicates someone who will discover new sciences, likes to build, avaricious materially, and inclined to farming. A double Saturnian line is on someone who is unstable, fickle, and wanders, living in many places, and will die poor. Mercurian line doubled is not to be envied, it denotes a loquacious, presumptuous person who labors at little gain, will go from his country and be in servitude. A double Solar line in contrast predicts an enviable future. This man will follow many roads with honor, love travelling, or that great leadership and rewards will be given to him, if he desires to live where they are. Single Saturnian line to the middle, straight and well marked denotes a man in his tasks, upright, prospering day by day, loving virtue, of great understanding. A crooked line means the opposite. A double Saturnian line broken off in the middle means a poor destiny, a man solicitous of gain, curious, ill spirited deceitful, unfortunate in his actions, and careful and eager in his dealings. Even how you carry your hands matters – a man who shuts his thumb into his fist is a miser, one who will get what he wants by right or by wrong. 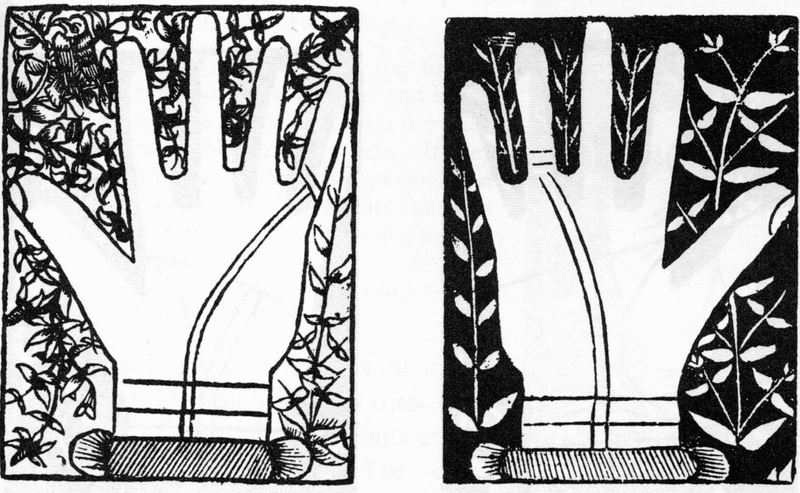 A practitioner of cheiromancy must consider in his study of the lines of the hand, their direction, number, length, breadth, depth, color, clearness, breaks, whether single, double, or even triple, or even their complete absence. 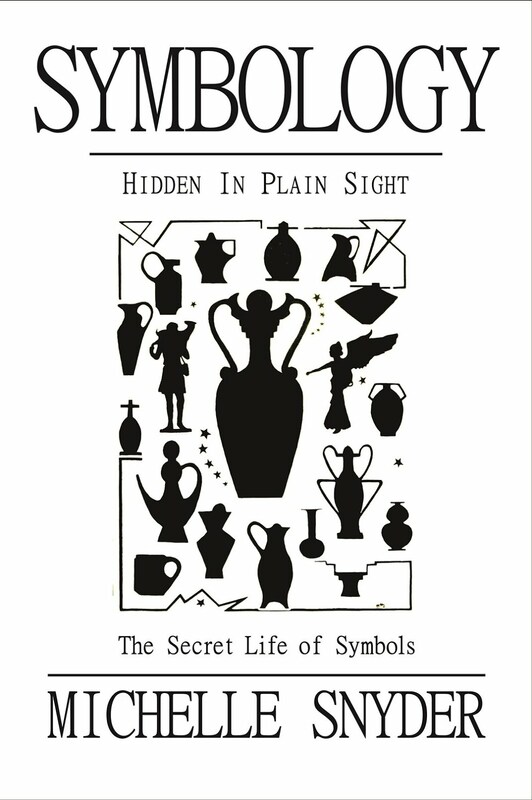 Other signs which may be found which add to interpretation are stars crosses, triangles, squares, circles, planetary signs, networks, knots, letters, figures, etc. Cheiromancy has enjoyed considerable favor in past centuries, and is perhaps the most popular of divinatory sciences today. 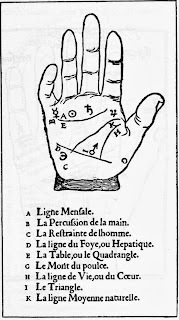 Men of learning, physicians, anatomists, and others have taken an interest in it, but like cartomancy, is chiefly practiced by women. 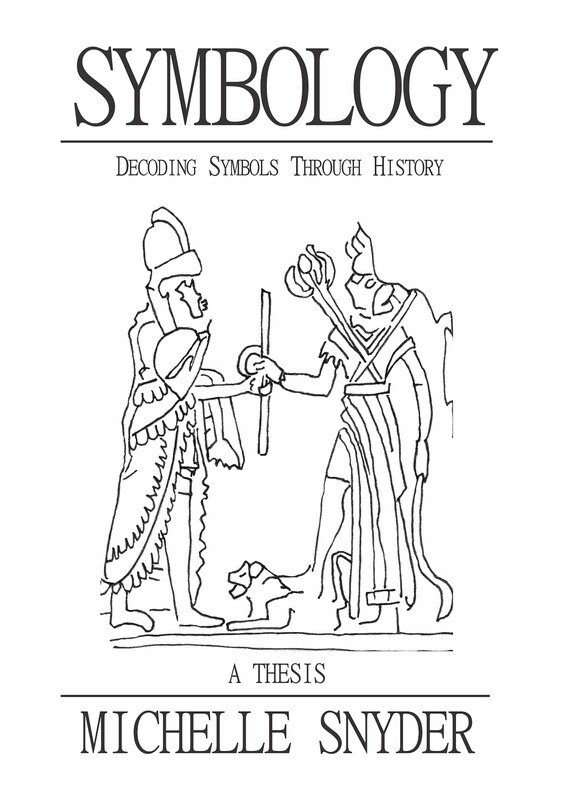 Astrology was mostly a masculine endeavor as the limited education of women did not prepare them for the complicated and arduous calculations it requires, but cheiromancy requires no calculations, only observation, memory, reflection, and intuition, which develops clairvoyance. This is the pre-eminent domain of women. 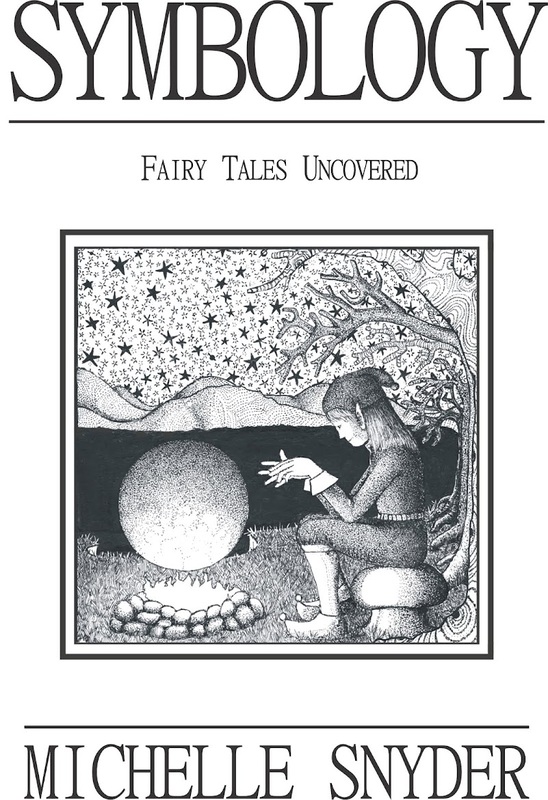 This art is also gifted to Gypsies and Bohemians, and those who live on the fringe of society and find compensation in knowing secrets of the hereafter, unknown to ordinary mortals. Every self-respecting witch can read the lines on a hand. What a revenge it is upon the great of the earth, upon the rich, the powerful, and the social magnates, to be able to tell them by looking at their hand “your days are numbered, you will die at such a time, you will do what you do not want to do and not do what you want to!” What humiliation is upon a king who finds he must descend from his throne, if only for a moment, to say “here is my hand. Should I sign this treaty? Go to war? Will I have an heir?” To some extent the soothsayer here is a tangible manifestation of Providence. Mlle Le Normand was a cheiromancer and cartomancer well-known throughout France. She was Josephine’s cartomancer, and so went to Napoleon’s court when Josephine became Empress. 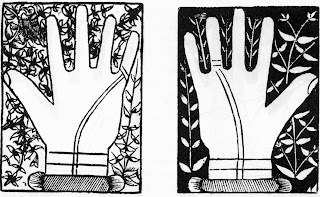 In her book are illustrations of the left hands of Josephine and Napoleon Bonaparte. In 1807 the Emperor, relented to Josephine and had his palm read. She laid before him his tastes and inclinations, most secret details of his character, and announced his now famous divorce. The complete record of her prediction was deposited in the Prefecture of Police, and fearing what she might do with her gifted discernment he secretly had her arrested and detained for twelve days, until the divorce was accomplished. There is much we do not know about our connection with the cycles of the universe. That we are connected is a powerful thing to understand. The vitamins we need, the medicine we take, all affects our skin and nails. An old song comes to mind – the leg bone’s connected to the knee bone, the knee bone’s connected to the thigh bone, etc. – which, in terms of the microcosm, reflects our connectivity to the macrocosm. 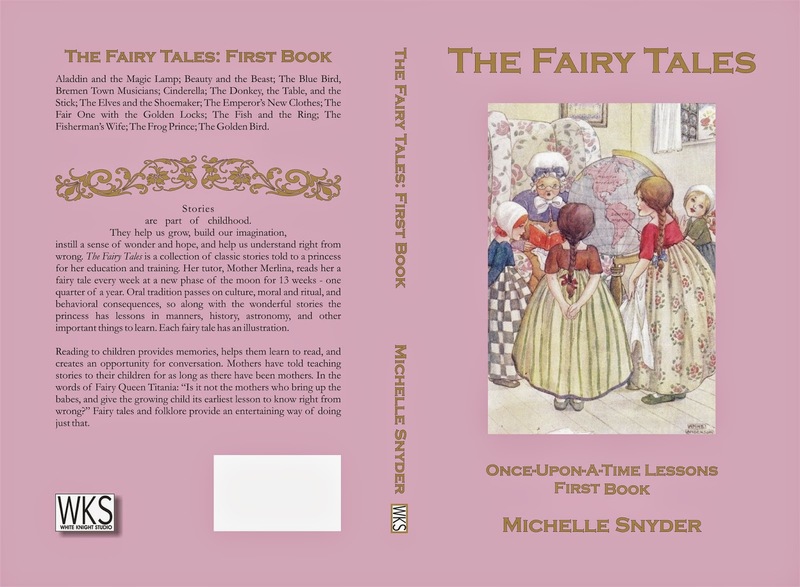 Michelle is a professor of mythology and symbolism, fairy tale author, blogger, and geek. She earned her post-graduate degree at the University of Wales decoding prehistoric images, working closely with Duncan-Enzmann. 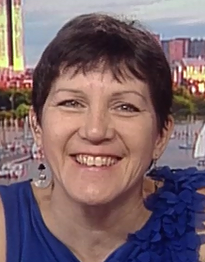 She is also a publisher, artist, and teacher. 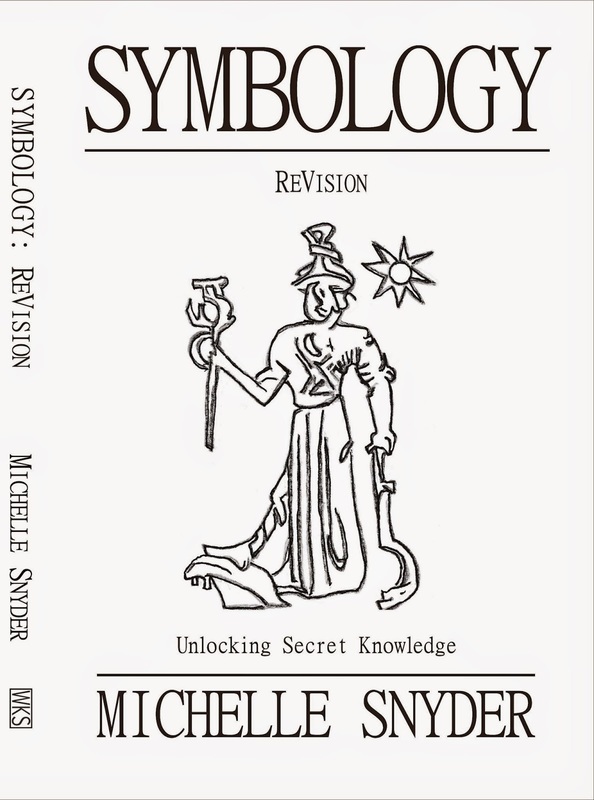 Her artwork, inspired by her love of symbolism and folklore, has appeared in galleries from Massachusetts to California. Michelle is co-owner of White Knight Studio. Handyman in Toronto Canada Awesome article post.Much thanks again. Much obliged. !!Wow!! 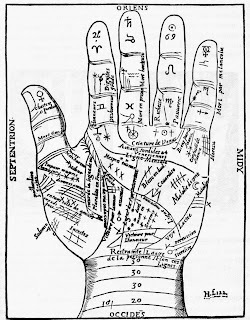 its best article with helpful information of palmistry..